It may have been announced just a few days ago, but at least one retailer is already willing to take your money for it. 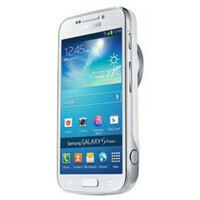 The Samsung Galaxy S4 Zoom is now up for pre-order in the U.K. and no, it doesn't come cheap. £467.99 including tax is what the device is priced at, which equals to about $733. For those who may have missed the news, the Samsung Galaxy S4 Zoom is a rather unusual Android smartphone with a 16MP camera, backed up by a Xenon flash. What makes it unique is that it packs a 10x zoom optical system and image stabilization for taking great shots even from afar. Further specs include a 4.3-inch screen with resolution of 540 by 960 pixels, 1.5 GHz dual-core Exynos 4212 processor, 1.5GB of RAM, 8 GB of internal storage and a microSD card slot for storage expansion. Android 4.2 comes pre-loaded. The retailer provides no details as to when the Samsung Galaxy S4 Zoom will be shipped to those who pre-order it, but that should happen pretty soon. In case you want to learn more about this peculiar handset, check out our Samsung Galaxy S4 Zoom preview. Man 733$ for this non sense ? You can get a very very monster hibryd camera or an entry DSLR for this price!!! What a joke !!!! you know it's crap when the sensor is only 1/2.33; that's smaller than even Nokia N8's camera. My sony dsc hx20v is better than this and currently sells for $350 where I live. But, diehard sammy fans will say that "you're camera sux coz it doesn't have android"
I would rather buy a Digital camera and a mid-range phone. the BRICK is coming out,waiting for elvis. Elvis has left the building (and took your outdated iPhone with him). How so?? That's the going price for many high-end smart phones with 4.3+" screens. As well as some mid-range smart phones with 4.01" screens, encased in fragile glass that's been glued together with KraziGlue and use Wi-Fi as its' main connection. Obviously, you haven't seen the promo video for the S4 Zoom? I wouldn't put the S4 Zoom with its' 16MP, 10x's optical zoom, OIS and the advanced software features native to the S4 Zoom, in the same category as the devices you mention above. Granted, the sensor is not the highest but, it blows the so-called mid-range smartphones with camera that you mention. The only two other models of interest at this point would be the Nokia EOS and Lumia 928, respectively. i'm expecting to see the eos to beat this phone on many fronts like a bigger screen, slimmer design, less weight, better looking screen, bigger sensor and lower price. S4 zoom is a joke i rather pay 100 euro's more for the Nokia EOS. The EOS will kill the S4! Samsung appears like a company with no focus; now that they have money they are starting churning out nonsensical devices only to cover even the tiniest market niche. But they do it wrong; why the S4 Active when the Xperia Z (and ZR) show that smartphones can be water resistant without needing special rugged and uglier design? Why be seen speaking with a camera glued on your ear when the S4 is already the best cameraphone in the market and the Nokia EOS (and the rumoured Sony Honami) will combine great camera tech in a proper smartphone shell?